By now, everyone has heard about the epic fight that took place in B-R5RB, both inside the game and out. 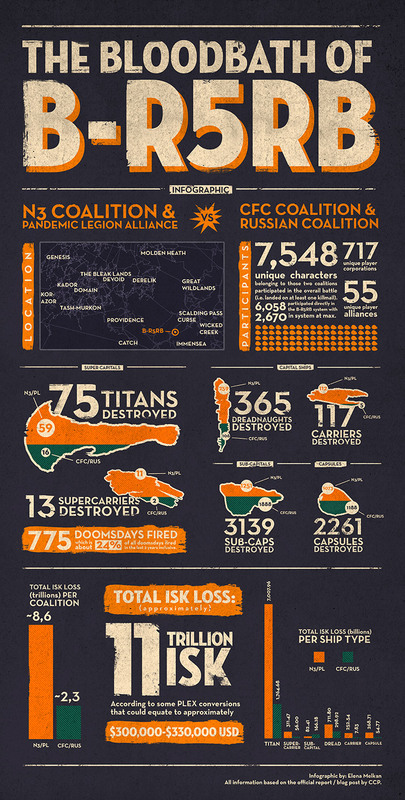 The fight took place between N3/PL and the CFC/RUS coalitions and amounted to a staggering 11 trillion isk worth of damage, roughly equivalent to $300,000-$330,000 USD in PLEX value. The fight was so catastrophic and monumental that CCP created a permanent memorial to the battle in the system. The following video is a player made video showcasing the “floating necropolis of decaying space hulks.” While not faction warfare related, this incident was so huge in the EVE universe that I feel it deserves a spotlight here for people to see. It truly makes faction warfare feel small in comparison. You can also see an impressive infographic below the video as well, created by Elena Melkan. An infographic on the destruction caused in the fight of B-R5RB. One thing that annoys me about the new models. All those little bits inside would be spinning and bouncing off of eachother. The debris field would be a lot bigger, not just concentrated on one area. That, and the fact that a tractor beam can pull the entire thing towards it. What’s really amusing is seeing that go on in a fight. I’ll have to find the video again, CAAN0N linked it to me, but the guy drops one of those new deployable tractor units in the middle of a capital ship fight, so there are volleys going back and forth between sides and wrecks just flying around the battlefield. Was pretty amusing.